Cotswold cottage for up to 4 guests within walking distance of many attractions. Lavender Barn East is one of two adjoining cottages. 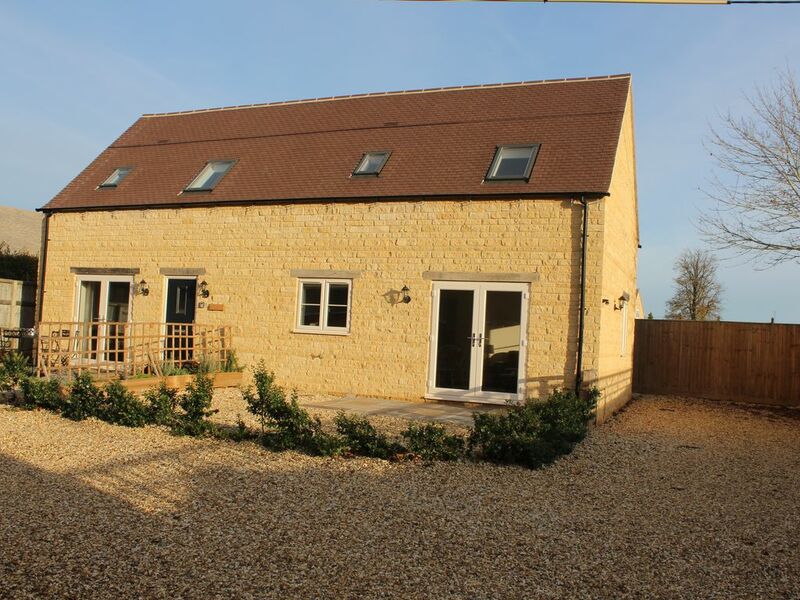 The cottages are purpose built in Cotswold stone. They are well furnished and comfortable. The cottage is very well located, only a few hundred metres from the centre of Bourton on the Water. Bourton offers many tourist attractions, shops and restaurants. It is an all year round destination and its pretty high street with the river and many stone bridges is know as the Venice of the Cotswolds. Downstairs is open plan with a well equipped kitchen area with electric oven and hob, fridge freezer, microwave, dishwasher, washing machine and tumble dryer. Sitting area, with comfortable seating and French doors to the patio. There is also a dining area. Gas and electricity are provided within your rental price. Travel cot and highchair available - NO cot bedding provided. Having had many enjoyable holidays in the Cotswolds we moved here in 2011. The Cotswolds is a lovely place to live and holiday and we hope that you enjoy it as much as we do. Lavender Barn is very well located for the centre of Bourton on the Water. It is within walking distance of all the main tourist attractions, restaurants and shops. It also is within easy driving distance of some of the areas finest tourist towns and attractions including Stratford upon Avon, Bath, Oxford, Warwick and Cheltenham. Gas central heating and hot water included within the rental price. Fitted kitchen with integrated oven, hob, fridge freezer and dishwasher. It also has a microwave, toaster and kettle. Washing machine and tumble dryer in a separate cupboard. Patio and graveled garden area with outside furniture. Charming little property that looks relatively new and is well kept, tucked away just behind the main street within short walk from all the attractions. The two bedrooms were comfortable and good to see both had en-suite, one with decent shower and the other a bath. Kitchen was well equipped for any length of stay and also had a downstairs toilet. Parking a plenty. Would thoroughly recommend this property to anyone considering a visit to this beautiful area. Beautifully fitted out cottage, it has just about everything you would need in accomodation. Very close to the village with an excellent supermarket right behind. Great walks around. A wonderful 3 night stay in this lovely property. very clean and homely. A great location to the village of bourton-on-the -water. This gem is tucked behind the houses on the street, which makes it private and quiet. Just look sharp for the modest sign on the street leading to the back of the property. Immaculate, spacious, lots of light and modern conveniences! Very quick walk to the grocery store. Enjoyed our dinner the first night at the Mousetrap Inn. Perfectly located for a walk on the public footpaths to the lovely towns of Upper and Lower Slaughter, and within driving distance to many other charming Cotswold towns. Loved it and would stay here again without hesitation! Nicely furnished and welcoming. Excellent position and great to have parking in such a busy village. All we could have wanted for a weekend break in an area we love.